Boett Blankets have proven over the years that they are the most effective rugs for combatting Sweet Itch in horses and ponies. Get 5% off Boett Blankets with eVetDrug! Simply visit the Itchy Horse website http://itchyhorse.co.uk/product/buy-boett-blanket/ & enter the code “evet1” in the coupon section of your shopping cart. These uniquely designed blankets act as a total barrier against the biting insects that cause the symptoms of Sweet Itch. Over 95% of owners reported that their horse showed a rapid & often dramatic improvement after they started to wear the Boett Blanket. • Are made of a unique, water-repellent, yet breathable fabric. Accept no imitations- other companies have tried to copy the unique design of the Boett Blanket but none of them are as effective, at treating & preventing against Sweet Itch, as the patented Boett Blanket. Boett Blankets are so helpful at treating Sweet Itch, that a number of insurance companies actually include cover for them under your horse’s insurance policy. Get 5% off Boett Blankets! 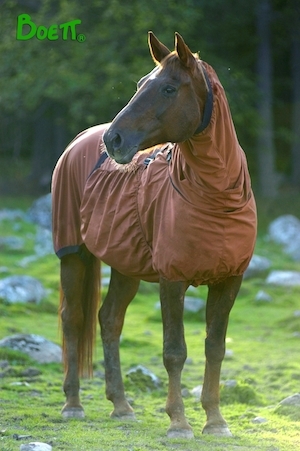 Simply visit the Itchy Horse website http://itchyhorse.co.uk/product/buy-boett-blanket/ & enter the code “evet1” in the coupon section of your shopping cart.